Molly had a heart procedure yesterday. Many of you may know some of the details, but I figured I'd tell the entire tale here. When she was little, her pediatrician heard a heart murmur, which led us to a cardiologist for an echo cardiogram. The echo revealed that she had patent ductus arteriosus (PDA), a condition where the blood vessel connecting the aorta and the pulmonary artery does not close entirely at birth like it is supposed to. They said it may still close on its own, but if it hadn't by the time she was 7, we should intervene and close it. A couple months ago, she had another echo which confirmed the PDA was still open. Fortunately, they can close this in the cardiac catheterization lab, instead of having to do open heart surgery. They go in through an artery in her groin and insert a tiny metal coil which closes the open ductus. It stays there, so she'll have a tiny metal alloy coil in her heart for the rest of her life. 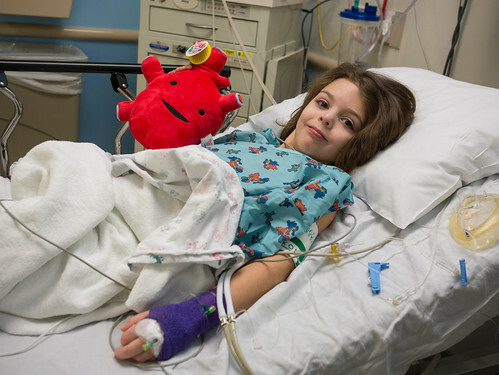 This procedure is pretty low risk as far as heart surgery goes, but we were still scared. Operating on my 7 year old's heart is serious. But, we still heeded the advice of the doctors and scheduled the procedure. We were at least comforted that we would be headed to Johns Hopkins hospital, one of the top hospitals in the country. 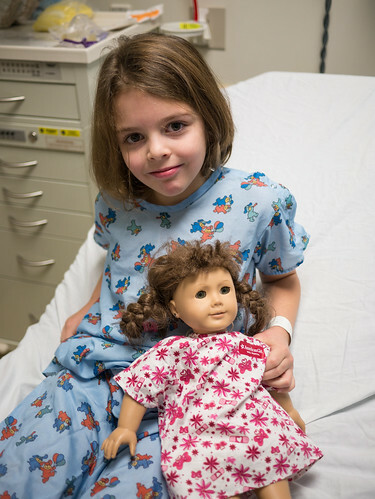 Here's Molly before the procedure with her Molly doll dressed in her hospital gown as well, who stayed with her until the anesthesia knocked her out. The procedure went smoothly without complications, though not without surprises. Once her doctor got in, he found that the ductus was only 0.8 mm in diameter. Had they known it was so small, they likely would not have done the procedure at all. Closing such a small hole is not worth the risk of intervention. He consulted with Molly's cardiologist, and they decided to go ahead and close it since they were already there. 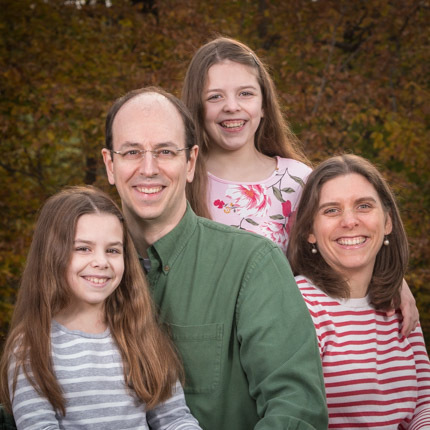 The surgeon also discovered that Molly's heart murmur was not caused by the tiny ductus, but rather by a previously undetected ventricular septal defect (VSD). He said it was very tiny and would likely not require any treatment at all. But, of course, that meant closing Molly's PDA would not make her heart murmur go away after all. All that said, we're just grateful that Molly is doing great. Here’s Molly in recovery afterword, along with a toy heart Mrs. Christy brought her. Amazingly, Molly had heart surgery and we were home by 4:00 that afternoon. We're making her take it easy, but she'd likely be out playing in the snow right now without any problems if we'd let her. She's needed no pain medication at all. Hooray for modern medicine. 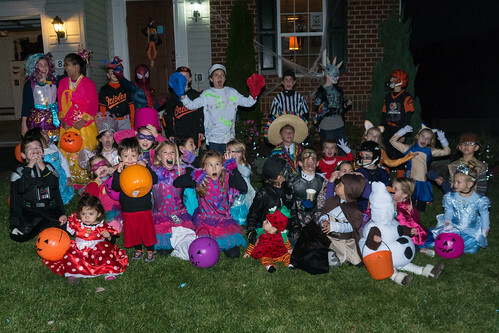 Like last year, we met up with other kids at our backdoor neighbors’ house before trick-or-treating. Here’s a picture of most of them before they swarmed the houses. 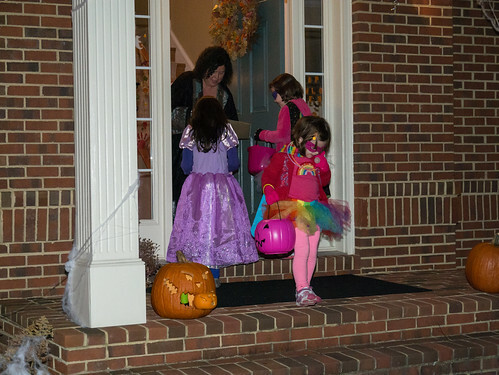 This year I went trick-or-treating with the girls while Jen manned our front door. We spent most of our time walking around with Jordan, Haley, Madison, and their cousins. 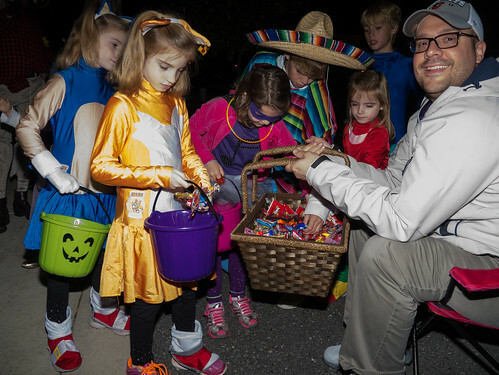 As always, our neighborhood is great for trick-or-treating. 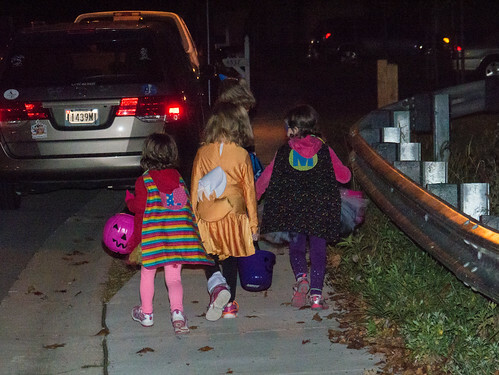 As you can guess, the girls came home with a lot of candy after only an hour of walking around. These two superheroes were happy to hang out with the speedy Sonic, Tails, and Knuckles.